Look in any design trends magazine this year and you will likely find a featured room that includes a Fiddle-Leaf Fig tree. 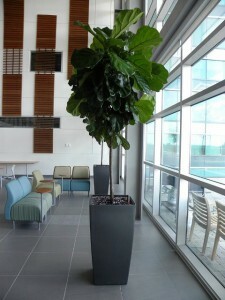 It is the current favourite of designers and is one of our most requested tropical office plants. This plant has impact! It has huge and unique fiddle-shaped shiny leaves that feel almost like paper. The tree is available in many styles including a column shape with multiple stems covered in leaves top to bottom, a tree form as pictured, and a tree form with a braided trunk. A newer variety is the “Little Fiddle’ , with more abundant, small compact leaves. The Fiddle-Leaf Fig requires bright light, preferably from a west or south window. It is a member of the Ficus family, which is native to swampy areas, so it needs to be kept moist. It does very well when set up in a pot with sub-irrigation (watered from the bottom). It tends to grow quickly, and will branch out into unique forms. Prune it regularly to keep it full and polish the leaves with a soft cloth periodically.Fertilize once per month from early spring until late fall.